The next time you dine out with your buddies, don’t forget to take your take your four-legged companion along. With restaurants, cafes, and dessert bars rolling out the red carpet for your pooch and your kitty, leaving them behind needn’t be your pet peeve anymore. Here's our round up of eateries in Bangalore that love animals as much as you do. You can thank us later. This dessert bar invites you and your pet to drool over their delicious desserts, together. The comfortable ambience means there’s enough room for four legs, a tail, and rolling about. Note that only the Residency Road branch is pet-friendly though. Enjoy the Beatles themed restaurant, and the views it offers, and take your furbaby to frolick too! The chefs are more than happy to accomodate your bff with special creations for them. The owners themselves bring in their doggos, so your pet can eat well and socialise, just like you! Bring your doggy along for a breath of fresh air at Green Theory. The greenery that surrounds this quaint little cafe, which is set in a bungalow, makes for a relaxing timeout. While you enjoy the continental vegetarian offerings from the kitchen, your companion can bask in all the attention that the pet-loving owners and patrons of the cafe dole out. Located just outside the city, Rasta Cafe provides a fun getaway for you and your pooch. Located on the Bangalore-Mysore highway, the sprawling space is perfect for a game of fetch between bites of the cafe’s much-loved munchies. The owner’s beloved dog lends his name to this popular restaurant. A charming bungalow looms in the backdrop, as you enjoy the gentle Bangalore breeze in the courtyard with your own pet. The European menu and the dedicated desserts bay are plus points too. Take your pet along as you pamper your sweet tooth at this compact dessert bar in the bylanes of Indira Nagar. Plonk down on the stone benches outside its glass doors, and relish your pet’s company as much as you enjoy those cheesecakes. A dedicated doggie menu including Liver Pâté and Handmade Crackers, Upside Down Shepherd Dog’s Pie, Dwaffles (can they get any cuter with their version of doggie waffles?) with Chicken Marinara and Apple and Bacon Ice Cream (can we humans have some please?) make this cafe our favourite, hands-down. 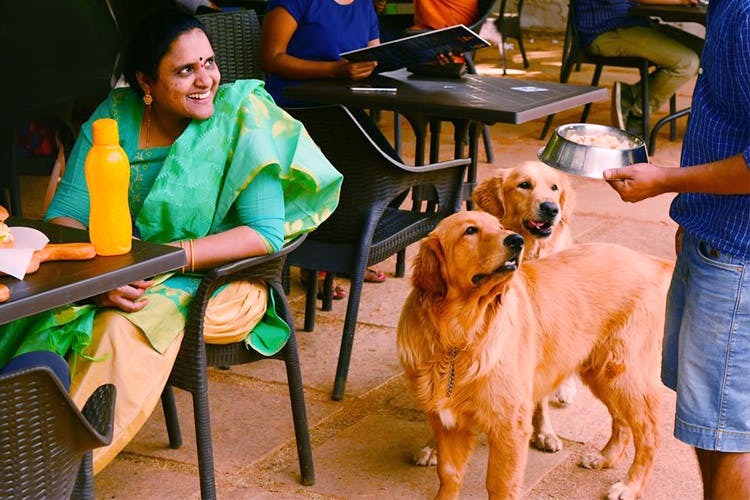 During its unrestrained Sunday brunches, The Fat Chef, attached to Jagriti Theatre in Whitefield, sees its fair share of pets accompanied by their proud parents. Sit at the feast table and enjoy yourself, while your dog meets-and-greets with his kind. On a not-so-busy day, you and your furry friend can park yourself at the open-air enclosure at Toit, one of the busiest microbreweries in our city. It’s a great setting to sip on brews and discuss the meaning of the universe and beyond with your wise companion. Make sure you have a reservation before striding in, though. One of the first places to welcome pets, Urban Solace sees a steady stream of your four-legged friends sashay through its doors. The weekend breakfasts, that are high on bonhomie, are when you should tag along with your pet for a lengthy meal and some company from your pooch. Breakfast runs at Hole In The Wall require the hole fam, furry ones included. If you're enjoying eggs, bacon, and some waffles, you can be sure you can share with your furbaby! And while you (and other patrons) wait in the long, long line to be seated on weekend mornings, what better way to spend time than play with your pooch right? Mighty Paws in Sarjapur is set in a quaint house with bright green windows. A cafe themed around wildlife and adventure, step in with your puppy poo and munch on your favourite Continental cafe bites from pancakes to pizzas. Read more here. This dog-themed cafe is a favourite with pet parents from all over the city. With seven resident dogs at the cafe, your pupper will have plenty of company here. Even if you aren’t a pet parent but love to cuddle happy doggos, come on down and be welcomed in with many wagging tails. With a menu for both humans and dogs, both of your can have your fill of good food here. Read on here. A great spot in the up and coming Bellandur neighbourhood, Maia is all about celebrating the world’s best cooks – Moms of course. With a menu full of recipes, collected by mothers everywhere, this vegetarian restaurant is bound to make you feel at home. And not just you, but your doggos are welcome her too. They’ve got a nice play area on their ground floor for pups to play around in. Read our full recommendation here. For all you health-conscious folks out there, The Yogisthaan Cafe is all about clean eating and living. Stroll in with your pupperoo for a wholesome meal, a nice green setting and to pet the residential doggo, Doctor. Read more here. Yep! You can bring your pet along to this microbrewery too. Down your craft beer and gorge on their Chilli Texan Fries, in this easy breezy space, all in the fine company of your pooch.